NOTICE: Be careful not to drop the injectors when removing the delivery pipe. (a) Remove the ventilation hose No. 2. (b) Disconnect the 4 injector connecters from the injector. (c) Remove the 2 clamps and wire harnesses from the delivery pipe. (d) Remove the 2 bolts and the delivery pipe together with the 4 injectors. (e) Remove the 2 spacers from the cylinder head. (a) Pull out the 4 injectors from the delivery pipe. (a) Install a new insulator to each injector. (b) Apply a light coat of grease or gasoline to a new O-ring and install to each injector. (c) Apply a light coat of grease or gasoline on the place where a delivery pipe touches the O-ring. 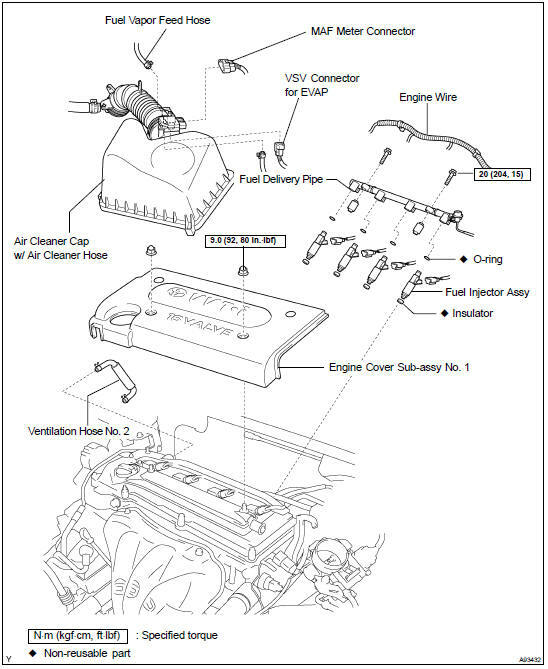 (d) To install the fuel injector into the fuel delivery pipe, push the fuel injector while twisting it back and forth. (e) Install the 4 injectors. Be careful not to twist the O-ring. After installing the fuel injector, check that it turns smoothly. If not, reinstall it with a new O-ring. (f) Position the injector connector downward. (a) Place the 2 spacers in position on the cylinder head. (b) Place the delivery pipe together with the 4 injectors in position on the cylinder head. (c) Temporarily install the 2 bolts holding the delivery pipe to the cylinder. NOTICE: After installing the fuel injector, check that it turns smoothly. If not, reinstall it with a new O-ring. (d) Position the injector connector outward. (e) Tighten the 2 bolts holding the delivery pipe to the cylinder head.